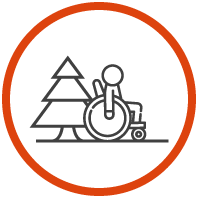 Due to the exceptional weather events that took place between 29 October and 1 November 2018, the accessibility of the routes described in this section is not ensured. We will update the portal as soon as we have certain information about it. “The mountains are for everyone, not just climbers: for those seeking rest in silence, and for those who seek even greater rest in their labours”. This is how Guido Rey, the Italian climber, described the mountains – and this is exactly what a World Heritage Site like the Dolomites should offer. The Dolomites should be accessible to everyone and a number of routes have already been freed of all barriers to allow everyone to enjoy the extraordinary Dolomite landscape. To make the Heritage Site more accessible, offering experiences and emotions to all those who visit it, whatever their needs and possibilities, the local administrations and associations involved in sport, accessibility and disability in the Dolomites have come together under the coordination of the UNESCO Dolomites Foundation to compile a guide which helps visitors find details of accessible itineraries, so everyone can explore the Dolomites World Heritage Site: the guide is the result of teamwork and offers consistent, detailed information concerning the Property’s universal values. An interactive map allows users to explore 23 routes of varying difficulty within the 9 mountain systems of the Property, providing them with information about the history of the Earth and the wonderful scenery offered by these unique mountains. Each itinerary contains interesting technical details.